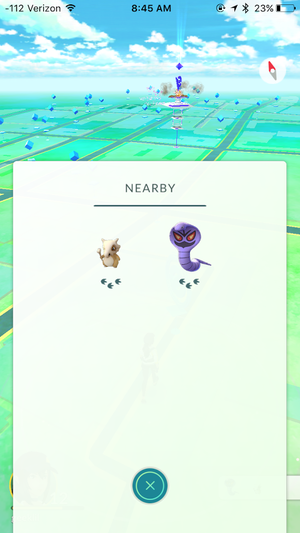 In the lower-right corner of your screen, you will see a small white bar with silhouettes of Pokémon that are close to your current location. 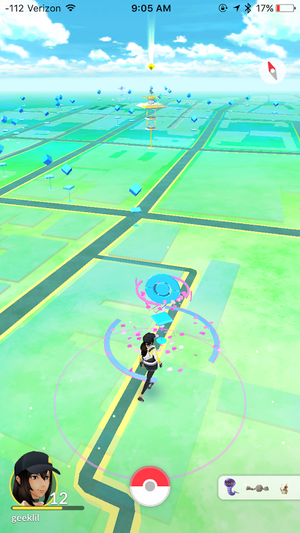 Tap this bar to see all nearby Pokémon; tap a single Pokémon to track it. These Pokémon will have paw prints underneath them denoting how close (or far) they are from you: One paw print means close, while three paw prints mean further away. These paw prints will decrease/increase as you get closer/further from the Pokémon. 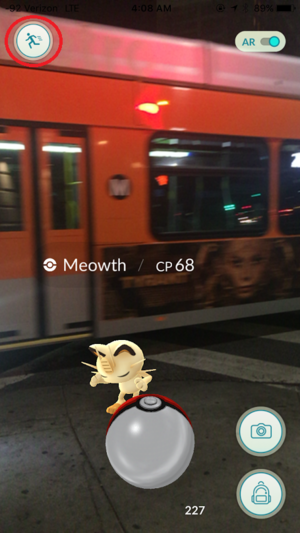 To catch a Pokémon, you’ll need to hit it with Poké Balls. This is fairly easy—just tap the Poké Ball and flick it toward the Pokémon. Each Pokémon will have a circle that is green, yellow, or red: Green means the Pokémon is easier to catch, while red means it’s difficult. As soon as you put your finger on the Poké Ball, the circle will start shrinking; if you hit the Pokémon while the circle is larger, it will be easier to catch (and less likely to break free). 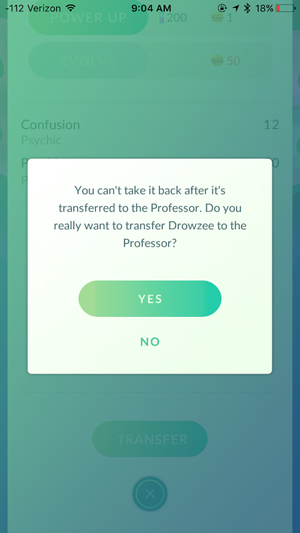 To transfer a Pokémon to Professor Willow, tap the Pokémon you want to trade, scroll down to the bottom of the screen, and tap Transfer. 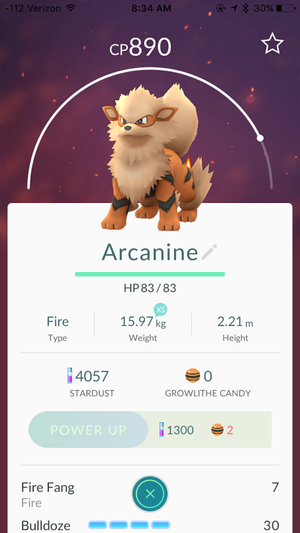 You will lose this Pokémon forever (so you should try to transfer Pokémon with lower CP), but you will get one Candy. 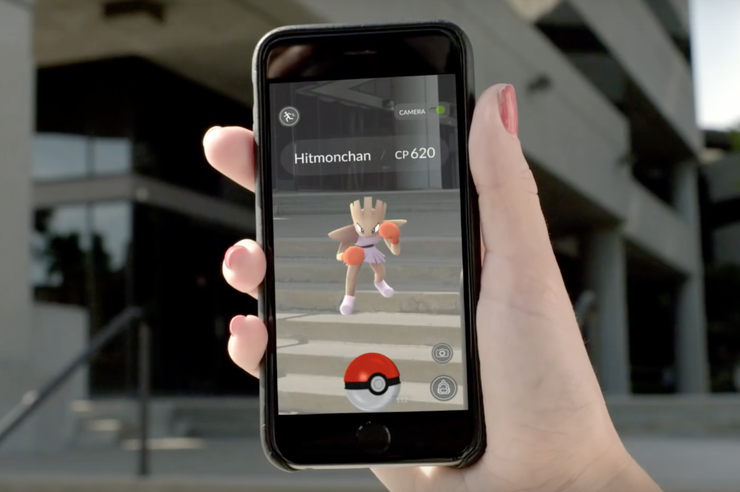 Pokémon Go is, unfortunately, a little biased toward cities, because it relies on landmarks and points of interest. If you live in a small town, or out in the country, you may not see a lot of Pokémon, PokéStops, or Gyms near you. 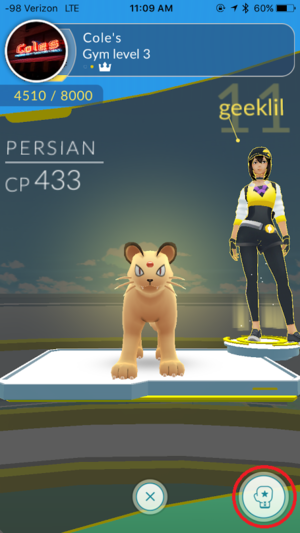 Gym prestige can be increased if friendly team members train their Pokémon at the gym (more on training below). As the gym’s prestige increases, more defense slots will open up, allowing more friendly team members to assign their Pokémon to defend the gym. (You can only assign one Pokémon to a gym.) Higher-level gyms have more slots—a Level 6 gym can have six defending Pokémon, while a Level 10 gym can have 10 defending Pokémon. With each gym level increase, the maximum prestige level also increases. So a Level 1 gym has a maximum prestige level of 2,000, but a Level 3 gym has a maximum prestige level of 8,000. To battle an unfriendly gym, walk up to the gym, tap it, and tap the battle button in the lower right corner. 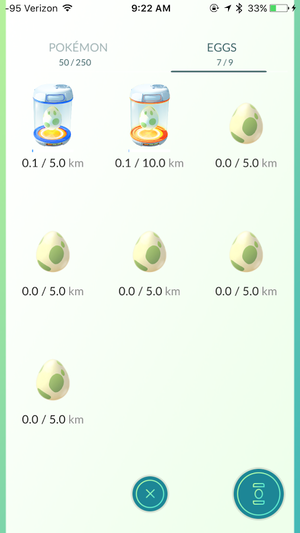 You will see six of your Pokémon pop up—you can swap Pokémon out by tapping them. You may not always want to take your strongest Pokémon into battle—some Pokémon types have advantages against others. Here’s a chart that shows you which Pokémon types are weak/strong against other types. 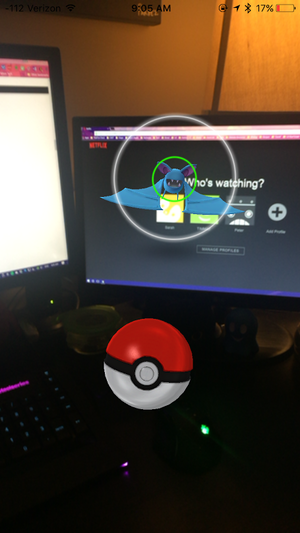 Once you’ve picked your team, tap Goto enter the battle. You have three moves at your disposal: Standard attack, special attack, and dodge. You’ll want to start off with standard attacks, which you can perform by tapping your enemy. You’ll also want to liberally use dodge, which you can do by swiping to the right or the left. Once you’ve performed enough standard attacks to power up your special attack (you can check this by looking at the blue bars underneath your name), tap and hold to perform your special attack. If you have multiple blue bars, you can perform this attack multiple times (assuming they’re charged). Why is this enemy Pokémon impossible to beat? You may encounter a known bug where an enemy Pokémon has 1HP but refuses to die. If you encounter this bug, shut down the app and reopen it. You will have to restart the fight, but all of your Pokémon will be restored to full health. What happens when my Pokémon get injured or faint? If your Pokémon get injured, you can restore their HP with Potions and Super Potions, which you can pick up from PokéStops. 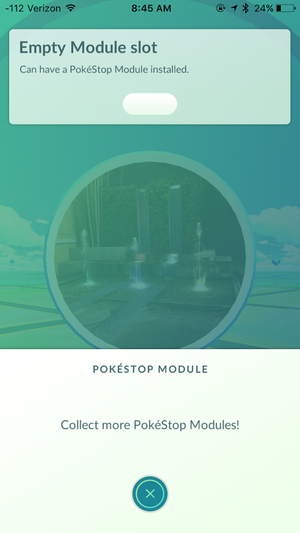 If your Pokémon faints, you will need to revive them with a Revive, which can also be found at PokéStops. You cannot use items during a battle. 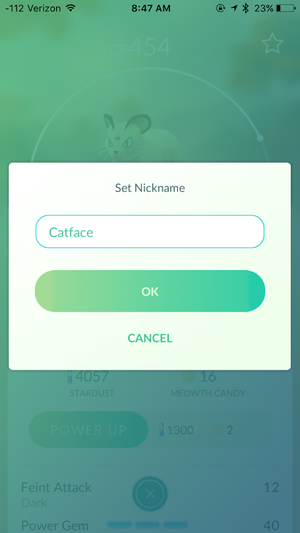 How can I train my Pokémon at a friendly gym? You can “train” your Pokémon at a friendly gym (a gym owned by your team) by fighting against the Pokémon defending it. To do this, walk up to the gym, tap it, and tap the train icon in the lower right corner. You can only take one Pokémon into battle when you train. Every time you win a battle against a friendly gym, that gym’s prestige raises. If you lose a battle at a friendly gym, its prestige is not affected. How can I drop my Pokémon at a friendly gym? If you encounter a friendly gym with an empty slot, you can drop one of your Pokémon there to help defend it. To do this, walk up to the gym, tap it, and tap the assign button in the lower left corner. When you drop a Pokémon at a defending gym, you will lose the ability to level it up or evolve it until it’s defeated and comes back to you. You will not get a notification if your Pokémon faints or is injured in battle and the gym is taken over by another team, but it will show up in your roster to be healed. If the friendly gym does not have an empty slot, you will need to train (win against the gym) until its level raises and a slot opens up. What do I get for being a gym leader? Gym leaders and gym defenders get Stardust and PokeCoins every 21 hours. If you are controlling or helping to defend a gym at the 21st hour, you will get these benefits by going to the Shop and tapping the shield icon in the upper right corner. The highest CP Pokémon defending a gym determines the gym leader. Have any other pressing Pokémon questions? Sound off in the comments below, and we’ll do our best to answer them.